A power trio of an entirely different kind, this Houston band — Laura Lee on bass, Mark Speer on guitar, and Donald Johnson on drums and piano — delivered a set pretty evenly split between their Thai-funk influenced 2015 debut, The Universe Smiles Upon You, and this year's more Middle Eastern-leaning album, Con Todo El Mundo. The pinnacle moment came with an instrumental medley that showcased a less obvious, and truly American, influence on their sound — hip-hop. Follow along, if you can. The trio took us on a journey that seamlessly moved from Dr. Dre's "Next Episode" to Ice Cube's "It Was a Good Day", on to Warren G's "Regulate" before circling back to Leon Haywood's 1975 hit "I Want'a Do Something Freaky To You" (famously sampled by Dr. Dre on "Nuthin' but a 'G' Thang"). From there, "Summer Madness" by Kool & the Gang and finally bringing it in for a landing with Luniz's "I Got 5 On It" feat. Michael Marshall and "Mary Jane" by Rick James. 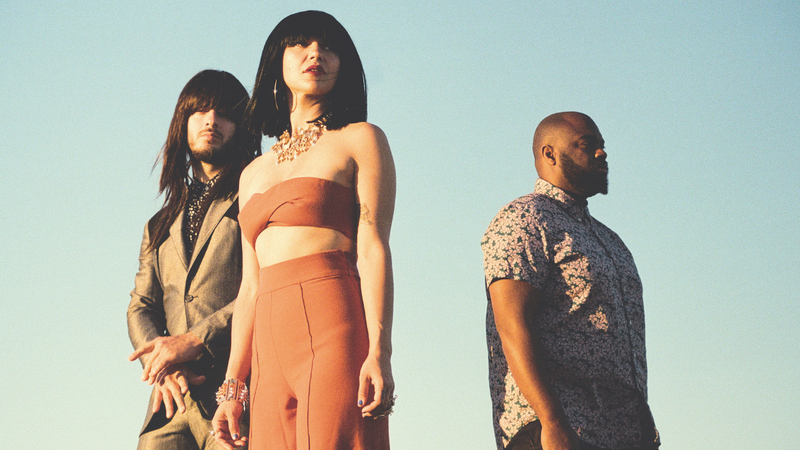 Hearing these songs all through the Khruangbin sonic filter was not only a masterful live mixtape, but in the backdrop of Newport Folk Festival, was an exciting way to make musical worlds intersect. "Two Fish And An Elephant"
"Evan Finds The Third Room"
"Nothin' but a 'G' Thang"
NPR Music Credits: Technical Director:Josh Rogosin; Production Assistant: Téa Mottolese ; Location Recording facilities provided by Aura-Sonic, Ltd.; Producer: Suraya Mohamed; Photography: Adam Kissick. Special thanks to TuneIn's Newport Folk Radio.